Marc Marquez witnessed the MOU signing with Ridwan Kamil. the MotoGP Champion Marc Marquez who came to the city of Bandung to greet his fans. PT Daya Adicipta Motora (DAM) as the main distributor of Honda motorcycles and spare parts in West Java strengthened its contribution to the progress of the community's economy by empowering Small and Medium Enterprises (SMEs) in West Java province. 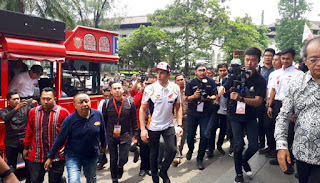 The signing of this cooperation agreement was carried out with the Governor of West Java Ridwan Kamil, and was witnessed directly by the MotoGP Champion Marc Marquez who came to the city of Bandung to greet his fans. Together with PT Astra Honda Motor (AHM), DAM collaborated with the West Java provincial government to support the One Village One Company Program which is being developed in this region. This collaboration is expected to build community creativity, especially in producing lokan products among MSMEs, which ultimately can stimulate the economy in the West Java region and its surroundings. "In West Java, we have carried out activities with the community, both educational and social oriented, economic empowerment, community development, cultural preservation, and the development of vocational education. Now, we want to expand again through the One Village One Company program for MSMEs along with the West Java provincial government, "said DAM President Director Krisgianto Lilikwarga on the sidelines of the signing of the cooperation at Gedung Sate, Bandung (9/2/2019). Through the One Village One Company program, AHM and DAM will absorb the creativity of MSMEs in West Java to meet company needs after previously providing skills training for residents. Meanwhile, the Governor of West Java, Ridwan Kamil (Emil) said that the collaboration was an implementation of the One Village One Company program where later villages in West Java would receive merchandise orders from Honda. "Here's an example of me as a leader looking for a company. Don't just be busy with the industry, but help the residents in poor villages through the program. So later the merchandises made by the villages were bought by Honda and made into merchandise, "he explained. Emil hopes, with the signing of this collaboration it can be a trigger for other entrepreneurs to cooperate with the West Java Provincial Government in other fields. Some excellent programs are open for cooperation with entrepreneurs or the private sector, including One Village One Company, One Pesantren One Product and cooperation in the preparation of industry-based Vocational curriculum. "This is the first step and our implementation increases the role of entrepreneurs in the pentahelix scheme to build an inner-born West Java champion," he concluded. The Governor of West Java Ridwan Kamil has just been visited by Marc Marquez at Gedung Sate, Bandung, Saturday (9/2/1019). This MotoGP world champion travels to Bandung with the Repsol Honda team and the management of PT Astra Honda Motor (AHM) goes up to Bandros (Bandung tour on bus) touring the city and ends at Gedung Sate. In uploading on his Instagram account, Ridwan Kamil also welcomed Marquez. In the video Kang Emil does use Indonesian. While Marc looked confused looking at Ridwan Kamil just saying 'Jabar Champion'. The upload was given a caption by Kang Emil "even though you mean what I'm talking about, what matters is the lotas gracias in the Java Occidental vision,". Suddenly, the caption, Kang Emil, received various comments from netizens.